After reopening its doors for business just a year ago, Albertsons announced the closure of the store on September 9. We wanted to confirm the rumors we were hearing from you and ask additional questions. As most know, both Albertsons and Safeway are owned by the same corporation. Closure preparations are already underway, with shelves partially stocked and some displays completely empty. We made a recent visit to the store during the dinner hour, typically the busiest time of the day, and the store was empty. We will be closing the Fairwood Albertsons store on September 9th. When we initially reopened the store, we did so with the belief that operating two stores in the region was the best way to service the community. Since that time, the performance of the Albertsons store has been consistently declining. We evaluated the store extensively for opportunities to improve its performance, but ultimately our business analyses indicated that we needed to cease operations at this location. We only make such difficult decisions after long and careful deliberation, and despite the best efforts of the company and our employees, we concluded that this store will not be able to adequately compete in this marketplace. Closing a store that has been underperforming and is not positioned for future profitability allows the company to focus its capital on store enhancements and better value propositions for our customers.Our Human Resources and Employee Relations team is working diligently to place as many employees in nearby stores as possible, consistent with the terms of our labor agreements. With respect to the Safeway and Albertsons banners, we are combining the best of both companies for our customers in all stores regardless of banner name. The favorite products of Albertsons customers, like fried chicken, fresh cut fruit and Choice Beef, are in Safeway stores, and the favorites products and programs of Safeway customers, like Just for U, fuel rewards, and our OWN brands, are offered in Albertsons stores. While the corporate response did answer a questions, a number went unanswered. We again requested responses to our remaining questions, and that request has gone unanswered. > Rumors are that part of the legal negotiations related to the settlement of Haggens stores required that Albertsons reopen for a period of time. Would you clarify what conditions needed to be met? What was the length of the lease for the Albertsons space? We’re estimating the lease was for one year. Why close after such a short period of time? > Our readers have noted a lack of effort such as completing store upgrades/updates to this dated space and promotional events to increase customer traffic. Because of what is seen as a lack of effort, neighbors question why the store was reopened. Can you respond to this perceived lack of commitment to the store/community? > Are other Puget Sound area stores similarly affected? Please supply that list. 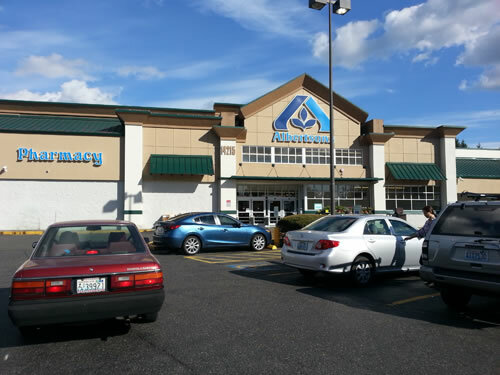 > If Albertsons is closing, do you have information on other potential tenants considering the space? > Readers express concerns about the current Fairwood Safeway. Comments include chronic, long checkout lines and limited stock that often runs out. What are your plans to address these issues, given one less grocery option will further tax the existing store? We’ll let you know if the spokesperson provides a response.